Borders is closing its stores. What does it mean for our culture? 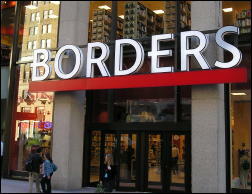 Today it has been announced that Borders is closing all its stores. You can read the story here. Big questions remain to be answered about what this will mean for the book industry. Bigger questions revolve around whether our culture is witnessing a significant change. We love to read, but are we becoming less interested in books? I hope not, but there are signs that Americans are becoming more interested in reading bite-sized chunks than full-length works. Our busy-ness is eating into our literary appreciation. The other day I had lunch with Phil Darke, CEO of Providence World Ministries. Providence operates La Providencia orphanage (plus school and medical clinic) in Honduras. Phil has also spent a lot of time gaining expertise in orphan care. Because of my work with Child Hope International in Haiti, I wanted to pick Phil's brain a little. I asked him how often he thought an orphanage should host visiting teams. Too much visitation isn't good for the orphans, but it is good to have some. What's the right balance? A church fall kickoff -- should we or shouldn't we? Not long ago I was talking with some Sanctuary leaders about what our church should do to mark the beginning of the fall season. "Are we going to have a fall kickoff? ", someone asked. It was a natural question. September is almost here, and the season will change from summer (the season of vacationing and recreation) to fall (digging in with church and school again). The group of us talked together about what a "fall kickoff" represents: church programs, marketing, and often a big dog-and-pony show. We agreed that isn't what we want. What to do then?